"Oh! It's Ginger! It's Ginger!" Nickelodeon seems to churn out new kids' shows on a weekly basis. From their update to The Rugrats called All Grown Up, to one of my daughter's favorites, The Fairly Oddparents, Nick is a cartoon juggernaut that seemingly will always be on the air. As Told by Ginger is one of their newer shows, but also one of the best. As Told by Ginger focuses on the title character, Ginger Foutley, a 7th Grader who has to deal with being an unpopular misfit in her school. 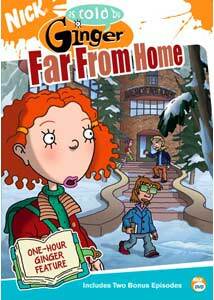 Ginger has three friends, Dodie, Macie, and Darren, who face similar problems. Throughout the first three seasons of the show, Ginger has made it through 7th and 8th grade, and now, in Season Three, she has entered into High School, which is a whole new ballgame altogether. This really is a fine show, helped largely in part by the wonderful voice talent. Ginger is voiced by Melissa Disney (who just happens to be Walt Disney's distant cousin), who does a superb job , and there are a couple of famous voices on board too, including Saturday Night Live's Laraine Newman, and A Different World star Cree Summer. The whole cast helps to make this the perfect animated series for kids who are wondering how the transition from grade school to high school is all about. The title episode, Far From Home, is a one-hour feature that focuses on Ginger receiving a scholarship to the Advanced Arts Academy. She's ecstatic, but Dodie is very upset, feeling that Ginger is abandoning everyone and everything that she loves. This is a very deep, moving episode that deals with some semi-adult themes, but handles them incredibly well, keeping them at the pre-teen level. From Dodie doing her best to deal with Ginger's leaving to Darren on the verge of revealing he deepest secret to Ginger, this is one of the better hours of animation to come along in quite some time. The Party (Pilot Episode): This is the first episode of As Told by Ginger, and is much shorter than the "normal" episodes in the series. Clocking in at a mere 12 minutes (compared to the regular 30 minutes), this episode has the popular Courtney inviting Ginger to a party. The big question is whether Ginger will actually go or not. Ginger the Juvey: This first show of Season One has Courtney inviting Ginger to her birthday party, and Ginger struggling to find the perfect gift for her. When that gift turns out to be the "Enter" sign to a bank, Ginger must decide whether it's worth the risk to steal it for Courtney. Image Transfer Review: There really aren't any problems with the full frame transfer, here, as the bright color palette is splendidly rendered, and sharp animated images are a constant. These episodes actually look better than they did on TV, which is more than fans of the show could hope for in a TV on DVD release. Audio Transfer Review: There's no problem with the Dolby Digital 2.0 audio either, as it more than serves its purpose by utilizing all of the surround speakers as much as possible. The dialogue is solid and always distinct, with no hissing or other problems to bog the track down. Extras Review: Along with Previews for four other Paramount DVD titles, the extras include an interactive game called Who Took Ginger's Journal? In this fun feature, kids must determine who really took Ginger's journal by matching the lineup of characters with the given clues. This is another case where it would be nice to see a show's future DVD releases come on a season-by-season basis. As Told by Ginger is definitely worthy of such treatment, but the solid audio and video, and nice couple of extra features are a step in the right direction.